Say something very obvious: "HIV is bad." (I can't find it now, but a relative literally posted one that said something exactly that informative about HIV). Prompt to share status for a finite amount of time. 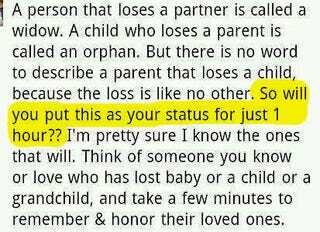 "I dare you to leave this as your status for just ONE DAY!" To be clear, it's really number 2 and 3 that bug me. Obviously, I don't mind that someone is trying to spread awareness about something - what I despise is the accusation that no one cares about these very obviously sad and important things that pretty much affect everyone. I haven't had a full night's sleep in like, 8 days. I am grumpy, I think. Sorry for the negativity lately!